Xilisoft Audio Maker Suite is a powerful discount pack, which consists of two products: Xilisoft DVD Audio Ripper and Xilisoft Audio Maker. 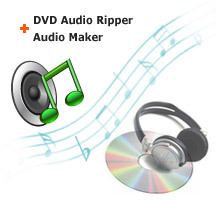 It is versatile audio tool including the functions of dvd audio ripper, cd burner, audio converter, and cd ripper. With it, you could easily rip DVD to MP3, WAV, WMA, AAC, OGG, RA, etc, fast burn audio CD, convert between all popular audio formats, and rip your CD to audio formats. Free download to enjoy now!